The Visions Anthology is the debut of the Surreal16 collective, who have in addition to the trilogy, released a manifesto filled with righteous ambition, and enough sarcasm to fulfill all entertainment criteria. They want to make movies, primarily for movie’s sake, and without any of the often hilarious and simultaneously cringeworthy characteristics films from the part of the country, tend to be associated. Consisting of three shorts, Shaitan, Brood, and Bruja, the films all take an introspective approach to the exploration of relationships, all baring some form of conflict. In “Shaitan” by Abba Makama, a lady confronts her constant fear of her boyfriend through a recurrent dream. In “Brood”, by Michael Gouken, a breakup conversation is framed with remarkable visual expertise, and in “Bruja” by CJ Feiry Obasi, a witch among her coven has to make a quick decision. It is to its testament, that the Visions Anthology is hardly filled with dialogue, in the case of one there is no dialogue at all. Yet, the concepts behind are as much explored with the exchange of words as they are with the camera angles. Baba Agba, the cinematographer on Brood and Bruja, after last year’s Ojukokoro, shows an eye for framing even the simplest-seeming of shots. In Brood, for instance, it is filmed with two camera angles facing the two protagonists as they go through a difficult conversation. The combination of acting, editing and framing against a remarkable background blends the colors and skill into an unforgettable freeze-frame image. In Bruja directed by indie rebel, CJ Obasi, the film relies often on the cinematography and the strength of the actors exchanging conversations with body language and stares. The film is shot and saturated with a red hue and many of the frames are slowed down for heavy effect. There is an almost dizzying sensation watching the witches in white, in a circle by the fire, on a beach swaying quite like whirling dervishes who have an uncanny power to stare the audience into understanding. In Abba Makama’s Shaitan, a more familiar setting occurs, much like Michael Gouken’s Brood. With a few spiritual insidious undertones. A photographer and her boyfriend engage in a conversation where the protagonist expresses a repetitive fear, in the form of a dream where the boyfriend adopts the persona of a Shaitan, a devil and feeds her the innards of an animal. Ridiculous to recount, but through the handling of millennial speak and the setting, a very familiar Lagos street locale, the film attains an instant relatability, even in the documentation of the protagonist’s dream. Shaitan is shot in a way not yet common fare with Nollywood standard, with the camera’s playing the protagonists leaning verticals against each other, and eliminating most of their bodies so we are robbed of physical gestures and have to focus on the exchange of words, the opposite of the effect in Bruja. Shot by Michael Gouken, the director of Brood. In the Visions Anthology, all three films pulse with a certain disregard and force. 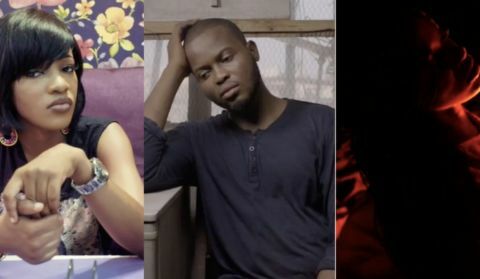 Akin to their manifesto, the anthology, their debut fare is determined to launch an alternative to Nollywood filmmaking, which is very much influenced by the things we see and hear around us every day, but explored with a more observant level of understanding. Art is but life duplicated with insights that escape many of us in those everyday encounters. It carries the capacity to elevate even the most seemingly mundane. And filmmaking, a collaboration of writing, music, and camerawork carries the most potential to elevate the difficult realities of being in Nigeria into a movement worthy of the Dogme 95, which it was inspired by.